Transcription of Sketch in the Christian Messenger by W.R.B. Away from the centres of our national life, away from the parts where our church life is strongest and most influential, it is just possible some meritorious worker may not receive the recognition his life and service deserves. Wiltshire is more or less isolated and unknown, although some of its towns by their new progressive spirit are rapidly restoring a lost popularity. Here, out of the currents, we have many worthy adherents and not a few who deserve to be called heroes. If we do not give a list of names it is purely for the reason that one equally honourable might unwittingly be overlooked. But there are those who for adherence to principle in the midst of pressures undreamed of in our northern provinces, service to their age in many spheres, loyalty to church which knows no compromise, and simple beautiful piety never surpassed and rarely equalled, are worthy of the very best recognition any community has in its power to bestow. 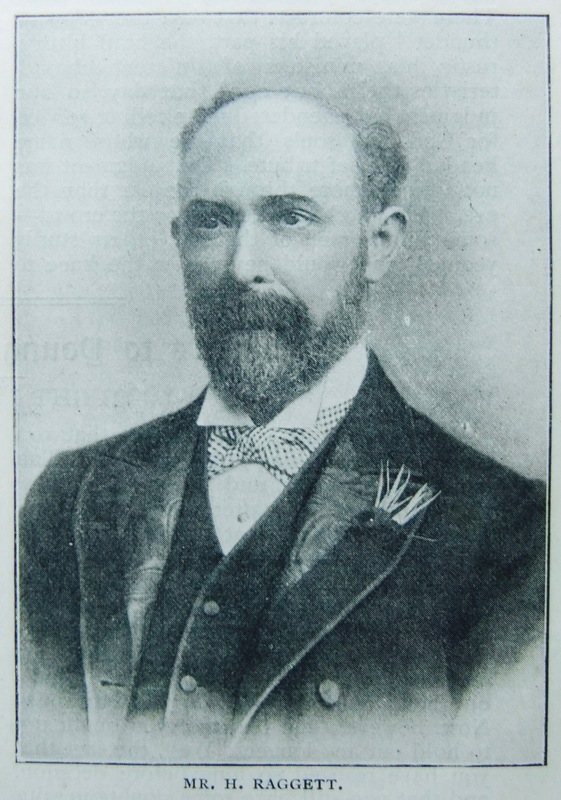 Mr. Henry Raggett is one of those who has earned the right to a niche in our gallery of honour. It would not be possible to get to Mid-Wilts and then describing a circle which would include Oxford, Gloucester, Bath, Salisbury, and Reading without learning in every Circuit something of his work and influence, and yet in all the long roll of our lay workers there is not one less ostentatious or self-seeking. He is of medium height and of middle age. He is a very fine sample of the new man which the last decades of the 19th century called into existence. His sterling character, his pure sense of honour, his business genius, his mental ability, have not merely won him many distinctions, but led many distinctions to be literally thrust upon him. But no position has given him truer joy than his church membership, which he has now held for thirty-five consecutive years. For thirty-three of these he has been a local preacher, serving in such a conscientious and cultured way as would have done credit to any pulpit we know. He has also held the offices of Class Leader, Superintendent of Sunday School, District Orphanage and Missionary Treasurer. Twice he has held a seat in Conference, and could more often if he would. Outside the Church he has been a member of the Swindon School Board, County Councillor for Wilts, vice-Chairman and Chairman of the Board of Guardians – an almost unique honour for an ardent Liberal and Methodist in an agricultural county, where squires and aristocrats jostle each other. At the last District Meeting, held under the shadow of the lordly halls of the Rothschilds, Rosebery, and others, it was our pleasure to hear his sermon at the Camp Meeting. Several times before we had heard him on various platforms, but this was the first sermon. It was an ideal effort – a fine blending of intellect and soul delivered with the quiet, deliberate, effective gracefulness of an accomplished speaker. Every word, every syllable, every accent told. There were contrasts that day, the “Son of thunder” played his part, the hard hitting rustic his, ministers of different characteristics theirs, but none that day, so our Judgment says, rendered more telling service for God and souls than he whose name heads this brief tribute. Our judgment was not formed more through the ear than the eye. We watched the effect on the crowd – some simple men of the soil, others sturdy yeomen who would never bow the knee to Baal, others tradesmen who were certain two and two made four, and a score or more of ministers. The sermon made them think and form resolves to live the “strenuous life “ – yea, and the Christlier. Mr. Raggett is the Steward of the 1st Swindon Circuit, an appointment he has held with peace and honour for several years, but in service, in generosity he belongs to all churches over a wide area. His wife is the sister of the universally known and universally beloved Mr. L.L. Morse, J.P., and she in every beautiful quality well merits any honour with either husband or brother. Two daughters and two sons are as proud of and as interested in our church as children can be. The home of Mr. Raggett is one of those quiet, sweet retreats whither Christian workers like to go and scores of Deputations, Special and Casual Visitors have had warm-heart-welcomes there. It is a place where the Lord reigneth. Henry was born in 1849 at Mortimer, Berkshire, to parents Henry and Caroline. Henry, senior, was a gardener. Henry worked as a tailor and master grocer. He married Amy Edna Morse (1852-1931) in late 1875 in the Highworth Registration District, Wiltshire. She married Silas Riddick in early 1912 at Swindon, Wiltshire. Census returns identify four children. Henry died on 29 April 1904 at Marylebone, Middlesex. This page was modified on 24 February 2018 to add a transcription of the obituary published in the Primitive Methodist Magazine 1905.